Recee Sam, Vallan Antoine and Geoffrey Gilbert at the presentation at NLA’s head office. 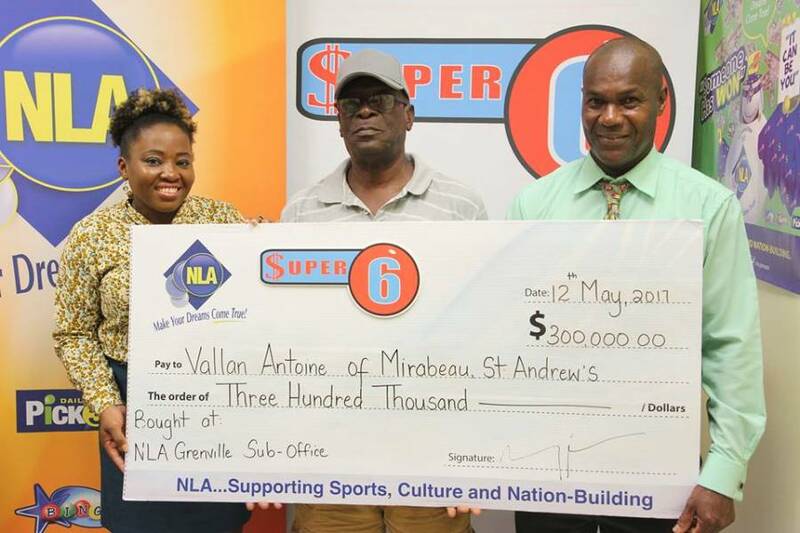 Retired Police Officer Vallan Antoine of Mirabeau, St Andrew is once again the winner of another large jackpot prize from the National Lottery Authority (NLA). Approximately 6 years ago, Antoine won the Lotto jackpot of EC$320,000 and this year, he won the Super 6 Jackpot of EC$300,000. The Super 6 game is played concurrently throughout the 4 Windward Islands on Tuesdays and Fridays. It has a starting jackpot of $200,000. Players select 6 numbers from 01 to 28, and each bet costs $3. The repeat winner remained calm, composed and very quiet during his presentation, is a well-known and regular lottery player. Antoine’s only words of advice to players was “You have to be in it to win it.” He purchased the winning ticket at the NLA sub-office in Grenville, St Andrew. Recee Sam, NLA’s Marketing Manager, was elated at Antoine winning. She reminisced on his past winnings, which included EC$13,080 in a single Daily Pick 3 draw. It was also a proud moment for NLA’s General Manager, Geoffrey Gilbert as he presented the cheque, describing the former officer as a “good symbol.” He reminded persons that they have to ‘be in it to win it’ and reiterated that the monies collected by the NLA support sports, culture and nation building.